Bourbon Red Turkeys, also known as Kentucky Red and Bourbon Butternut Turkeys, were developed in Bourbon County Kentucky, US in the late 1800's. They were developed by J. F. Barbee who crossbred Buff, Bronze, and White Holland Turkeys. 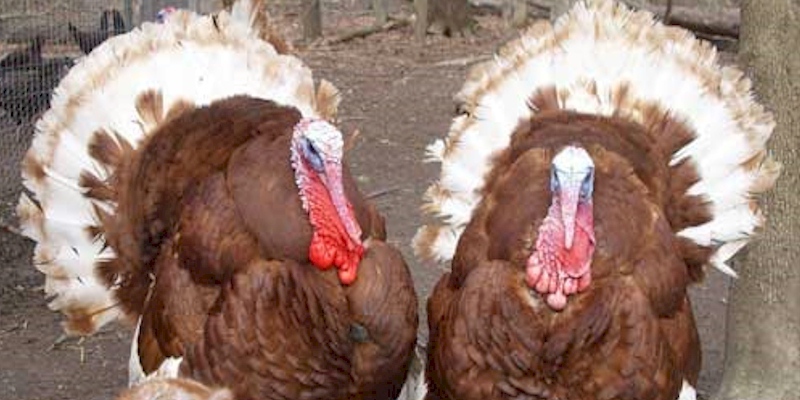 Bourbon Red Turkeys have a light-gray beak, red to blueish wattles, a black beard, and pink legs and toes. Toms weigh around 23 lbs and hens weigh around14 lbs. They lay large potted cream and brown eggs. The Bourbon Red Turkey breed was recognized by the APA in 1909. They became popular because they have a large carcass with a rich flavor. They were a popular commercial turkey between the 1930's and 40's. However, they because less popular after broad-breasted turkey varieties were developed. Recently Bourbon Red Turkeys have made a small comeback for research, due to their fitness, survivability, and meat flavor. They are considered a heritage breed and are still on the watch list by theAmerican Livestock Breeds Conservancy. Bourbon Red Turkeys are also included in the Slow Food USA'sArk of Taste, a catalog of heritage American foods in danger of extinction. Bourbon Red Turkeys are active and great for ornamental uses as well as breeding. They are considered a handsome bird and great for backyard farming.